WARRANTY: Residential Use: 4-year or 500-hour (whichever comes first) limited warranty covering parts and labor. Commercial Use: 2-year or 500-hour (whichever comes first) limited warranty covering parts and labor. POWERFUL AIR-COOLED ENGINE: 674 cc, 2-cylinder, air-cooled Kohler Command V-Twin engine. EXCLUSIVE T-DRIVE™ TRANSMISSION: Tandem Parker pumps-in-reservoir transmission is specifically designed for turf-care applications In-line CoolFan™ cooling system and integrated, replaceable, high-efficiency fine-particle filter Design directs more power to the cutting deck as power-sapping components are eliminated. ANTIVIBE POWER PLATFORM®: Isolates the engine and T-Drive™ from the operator platform for an unprecedented vibration-free experience. ULTIMATE OPERATOR STATION™: ComfortZone™ seat eliminates jostles and jolts with coil-spring suspension and a fully padded, high-back seat, padded armrests and variable density foam cushion. 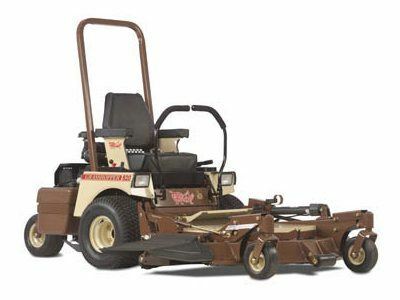 Iso-mounting smooths the ride, erases fatigue and keeps the operator comfortably in control at faster mowing speeds Operational controls  including throttle, choke and angled View-Eze™ console  and adjustable cup holder are well positioned for visibility and ease of reach Hydra-Smooth™ dampened, dual swing-out levers provide easy on/off access and smooth, instinctive control, and adjust to operator reach for increased comfort. Levers are less strenuous than riding mowers with steering wheels ComfortReach™ "no tools" dual steering lever adjustment provides a custom fit for any operator while maintaining natural arm and wrist positions. MINIMAL MAINTENANCE: Fewer than 10 grease points and easy top-side access to belts and filters 1,000-hour transmission fluid change intervals Self-tensioning belts minimize cost and labor on routine maintenance. BUILT FOR LONG LIFE: Robotically-welded, high-grade steel construction and I-beam reinforcement for long-lasting durability Centered-bearing design provides greater load-bearing capacity to easily handle the weight of operator, fuel and high-capacity collector with reserve strength for curb shocks and weight shifts Tough-as-nails powder-coated finish is fusion-bonded for chip and rust resistance. HEAVY-DUTY DECK: Extra-deep, 5.5-inch deck is fabricated from heavy-gauge formed steel with a reinforced anvil edge Specially designed cutting chambers enhance airflow for better cut quality Deck easily converts from side discharge to optional Down Discharge™ mulching or PowerVac™ collection Sentry™ spindles with massive, 8-inch flanges anchored in a 6-bolt pattern, spread the force of impact for greater strength Spindle planes fabricated from double-layered, 10-gauge plus 10-gauge formed steel laminate that is 0.269 inch thick 7.6 percent thicker than ¼-inch steel Sentry™ spindle guards shield spindle housing and seal lower bearings from fiber wrap and dirt ingestion. VIGILANT OPERATOR PRESENCE SYSTEM™: Standard, low profile operator protection structure (OPS) with an adjustable seatbelt Dampened steering levers that return to neutral from forward and reverse Interlock switches that shut down the engine when the operator leaves the seat while PTO is engaged or levers are in drive position. QUIKCONVERTER™ IMPLEMENT CAPABILITY: Add or remove implements in minutes without tools with QuikConverter™ Implement System Equip your out-front mower with a wide range of tools, including turf cleanup, renovation and snow removal implements that extend your productivity year-round.